There are several important focus groups of the daily work of EstateGuru team – investors and borrowers. However, under the initial silhouette the IT development team is working restlessly to ensure the daily functioning on the platform, its security and continuous development towards efficiency and increasing user experience comfortability. Followingly, we will provide you with an overview of the updates that have been included on the platform recently. The main keyword for an online investment platform is ensuring the security of the technology and users’ privacy. Due to this, EstateGuru has added two additional opportunities for increasing the level of users’ security. Investors have been given the chance to include additional verification method for confirming transactions through SMS. This means that to increase the level of security investors can take on additional obligation to verify their transactions with an SMS code that is being sent to their mobile phone. Through this, the investor can avoid malicious transactions made from their account through hacking or losing their password. The SMS-verification method can be applied from the platform’s setting. To increase the level of security, an additional verification opportunity has also been created for the Estonian borrowers. With this, the borrowers have the two opportunities to confirm loan applications – with password and Mobiil-ID. In the future, the password-verification method will be eliminated and only more secure options will remain valid. The purpose of the change is to avoid malicious actions and place additional obligation to the borrowers in order to avoid potential arguments concerning the funding of loans and the loan applications. Within these updates, heavy focus has also been set on improving the user experience on the platform. Firstly, an edit mode has been created for the shared account function, meaning that the owner of the shared account can from now on also make transactions in addition to merely viewing the account. The purpose is to enable investment managers and their clients or family members to operate from a mutual account. The feature can be applied once logged in to the platform and going to the page „Shared account.“ The explanation of how to activate the feature can be viewed in a previously published post. Also, the well-appreciated Auto Invest tool has been improved to match the investors’ wishes. Namely, we have created additional criteria for choosing your investment – the rank of mortgage upon which the loan will be given to. Furthermore, a simple overview of investor’s portfolio has been added to the investments page, from where the investors can view their available funds, loan principal, earning and earn even more by inviting their friends to invest. Also, by choosing „Portfolio detail“ from the menu above, investors can see a comprehensive overview of their portfolio in which all late loans have also been explicitly market with a respective status. 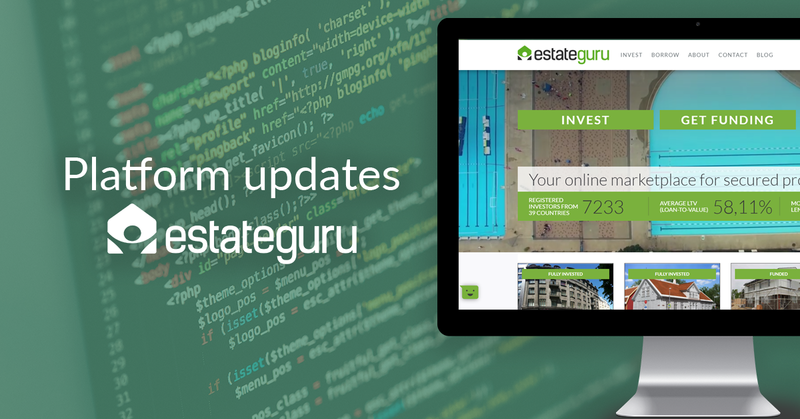 When only last month EstateGuru launched the loan update section, then now we are ready with first improvements for the feature! Namely, we have created a notification section which is clearly visible on the upper right corner of the platform once logged in. Whenever a manual update is being entered into the system concerning any loans that a particular investor has invested in, then a respective notification will appear on the upper right corner of the page. This will help ensure a good communication by informing the investors of any late payments, changes in the loan contract or early repayments. To conclude, in order to simplify the registration and sign-in process, a new sign in page has been created on the platform. The team is continuously working towards improving the platform’s loading speed and adding new languages so that people would have the chance to operate on the platform in their native language. When in May EstateGuru launched their German website, then in the near future Lithuanians have a reason to cheer! EstateGuru team always appreciates feedback and ideas from users of the platform in order to make the platform’s solutions more comfortable for the end-user. All your feedback is welcome on the address info@estateguru.co.